The family Favelle — Anthony and Caroline with son Lincoln — flew in from Australia two days earlier. Jeff-Free, a retired contractor playing his harmonica on a blanket by the beach, was visiting from tiny Schoharie, New York. Steve and Kelly Agius of Ontario, Canada — vendors “chasing the sun” — sold hippie goods, including sage, under the Gypsy Halos brand. 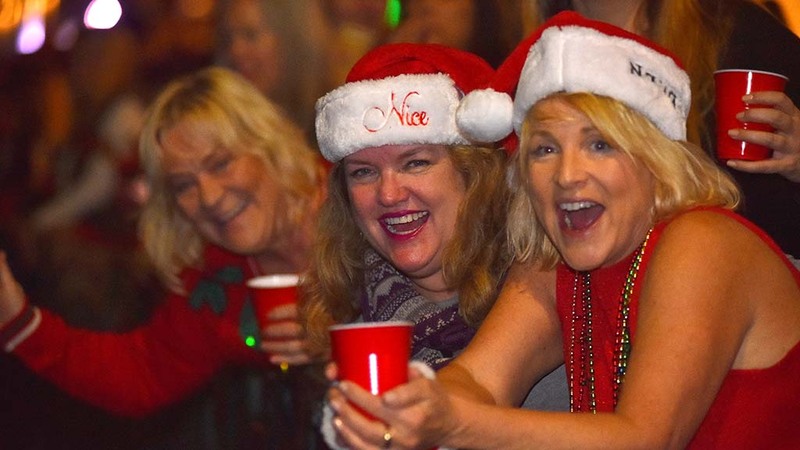 Who says the OB Holiday Parade is just a local affair? 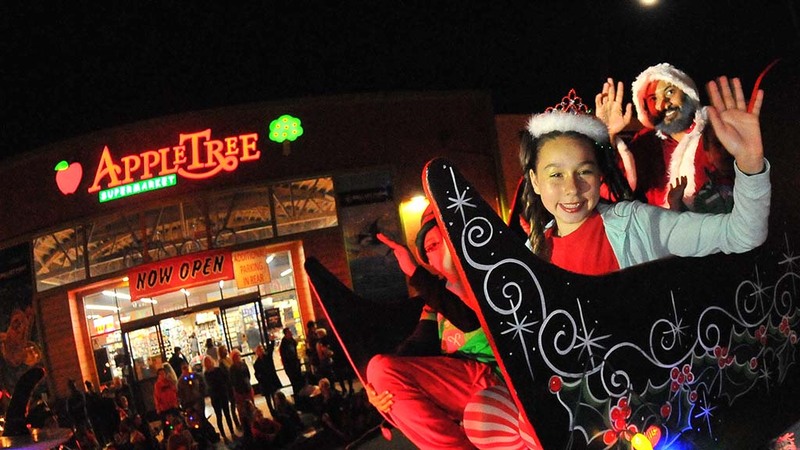 Expected to draw 2,500 people, the 38th annual parade actually had a crowd estimated at 6,000, according to a spokesman for the organizing Ocean Beach Town Council. The event’s theme “California Dreamin’ in the Season of Love.” A full moon watched from the northeast as temperatures hovered in the comfy upper 60s. “Something magical about this” place, said the 58-year-old going by Jeff-Free, with his father’s accordion and an ukulele resting nearby. The Favelles were staying at the Hi San Diego Point Loma hostel. Later, they’d be heading for Seattle and then Montana. One hundred units (the maximum) in a 90-minute parade proceeded west on Newport Avenue toward yet another leaning OB Holiday Tree (but this year’s version tilted right, not left, as viewed from town). At the Ocean Beach Hotel — across from the beach — balconies of the three-story landmark were filled with revelers. Even before the event began, renters were making reservations for the 2018 parade. The usual civic lights made an appearance — San Diego Mayor Kevin Faulconer, Shelley Zimmerman in her last OB parade as police chief, Assemblyman Todd Gloria, Councilwoman Lorie Zapf. San Diego County sheriff candidate Dave Myers, a Democrat, walked. So did Marcia Nordstrom, a Republican hopeful for the county Board of Supervisors. But the real stars were the Obeceans — driving woodies and DeLoreans, playing in rock bands aboard floats, marching as Republicans or Democrats or promoting causes (clean climate, no Target in OB, expand the OB library). Seven or eight Ocean Beach Town Council volunteers did announcing duties at intervals along the parade route. About 60 people volunteered at the parade. 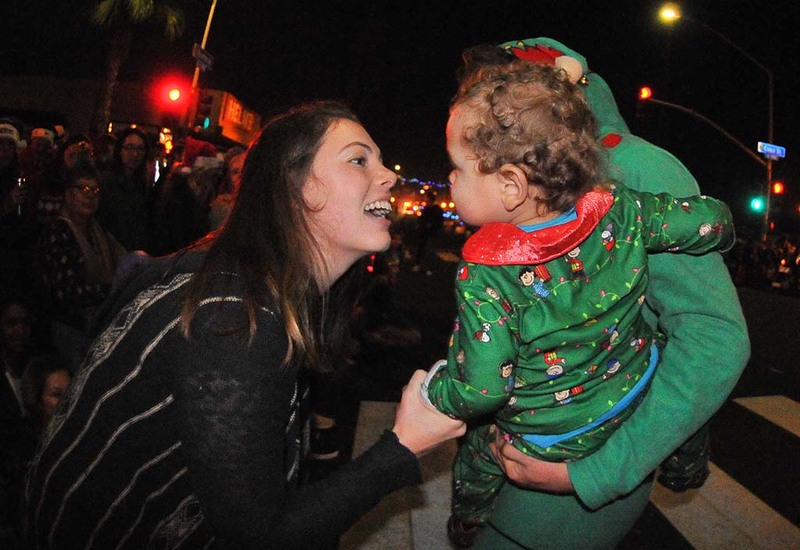 Santa Claus — OB Town Council Vice President Marcus Turner with a black beard and kids in tow — rode atop a final float, courtesy of San Diego lifeguards, leaving hundreds to find their way back to cars or warm and well-lit bars.